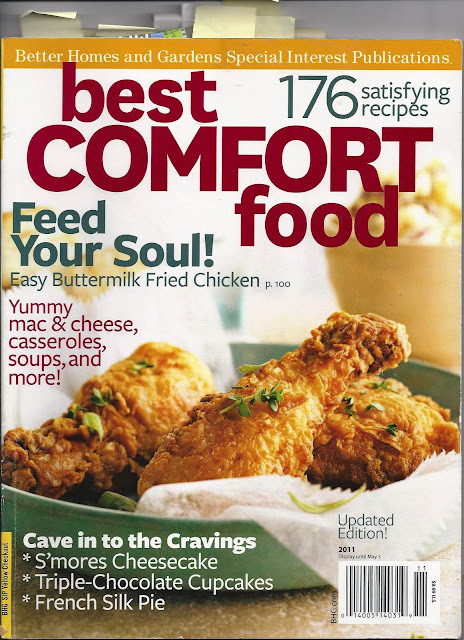 When Myrna brought “Better Homes and Gardens best comfort food 2011 edition” to coffee time Monday, she commented “We must have really liked this one!” I could see what she meant – it was full of sticky notes marking recipes we had planned to make. That’s high praise from us…it’s not unusual for us to look at a potential cookbook and come back with the comment “I just couldn’t find anything we would like...” or “Nothing new in this” or “Just the same old recycled recipes”. This is a magazine-sized special interest publication; and may be hard to find, but worth it if you see it used. Who can complain about a book that has chapters on potatoes, chocolate, pasta, breads, diner specials, pies sweet and savory, etc. We found plenty of recipes in this 176 recipe book, as you can see below.